I just bought a 70 squareback and i am bound and determined to turn it into a baja. Its like a disease! i cant sleep and i have been spending every minute of free time either working on it or looking at this forum for tips. i have read 57bajas thread a hundred times. i guess he is my new hero. so far i pulled the engine and cleaned it the best i could with what i had. it ran but not very well when i picked it up. it was covered in oil. got it all clean hopefully fixed all the leaks and i am waiting for parts from chirco. lifted the front, whata pain! i may have to reindex again i don't think my ball joint will handle what i did. if i go with type IV axles and CV's will the CV's bolt up to my stock trans? i want to grind off the spring plate tab to get more height. Very nice. 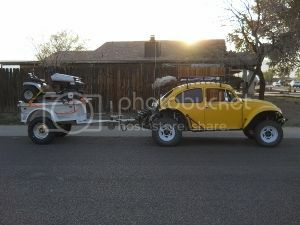 I was in a Baja a VW fastback but I wasn't able to find a suitable donor in time. 1) replace the ball joints with aftermarket lowered ball joints they work just the same in the raised position plus I understand that they are a little bit beefier to handle the extra stress. 2) the rear clip of a type III unbolt and drops right out. To save money and aggravation I would weld in a late model VW bus rear portion housing this will give you a much be beefier base to work off of and it comes with thicker torsion bars to boot I would not use the bus trailing arms because the cast housings tend to crack and break but I would weld in the mounts for a VW bug 3 x 3 trailing arm right off the bat. In less your racing the vehicle the Chinese 3 x 3 trailing arms should work just fine in your type III rear drums will bolt right up. 3) since your vehicle weighs more than an average VW Baja you might want to consider installing Timken roller bearings in your rear arms once you put them in you will never have to worry about blowing a rear bearing again. part # 17244 & 17118 you will be sticker shocked if you try to buy them locally I was able to get them off of Amazon and eBay for about 100 bucks for all four. About 17 years ago I installed my first set of Timken bearings in my off-road vehicles and I purchased two spares to carry with me just in case I broke one, I still have both spares unopened and unused. Which I have transferred to my Baja where they sit and collect dust under my rear seat. 4) examine your front bearings if they are the original German bearings I would inspect them for damage and reuse them. If there are a cheep set a bearings... I would replace them with a good quality Timken bearing it does a lot of damage when these bearings let go. 5) I would look around and find a set of 3 inch raise spindles they are usually manufactured by the same folks that produce the 3 inch lowered spindles I was able to obtain mine for about $225 they are worth every penny. 6) if you're planning to power your ride with an air cooled motor. I would put in a stock .002 bus transmission because first gear is the lowest stock gear out of all the bus transmissions. ( Except gear reduction bus transmissions) fourth year is a little lower than the stock bug transmission( I think) but this lower gear stack makes it easier turning in oversized rear tire making the overall vehicle more drivable on and off-road. 7) I would go with 930 CVs right off the bat the cost is just about the same as upgrading to type 4 or bus CVs and will prove to be a much more reliable package. try to find the room to install a turning break you'll find this extremely useful when you're off roading.. I prefer the dual stick way above the single stick.. Because if you're on a hill you can pull back both sticks at the same time and be able to move your foot off the brake pedal and onto the clutch without rolling backwards you can't do this with a single stick. 9) purchase a good quality suspension seat this would improve the ride immensely. 10) I would find another type III front end and weld the two together to make a wider front beam somewhere between 6 to 12 inches the bolts in the same spots where the stock beam bolts. You might want to consider at this time lengthening your shock towers. I would start out by using a KYB "white" shock to start out with before purchasing a high-performance shock. Due to the weight of the vehicle you will have to buy a high-performance shock may be 2 for the rear of the vehicle. 11) and less you're going with power steering I would keep the steering wheel size around 14 inches. When you pack your bearings don't use the cheap grease it will allow water to pit your bearings you will have to replace them. I my racecar the grease I use is a synthetic marine grease it runs me about $45 a tub but my bearings are around $550 a piece so I must take care of them. Which reminds me I am due to clean and inspect them this year. Now I my Baja bug I use Mobil one synthetic bearing grease from AutoZone it seems to do well for the application that I'm using it in. Once the bearing heats up it coats the bearing with a water resistant coating that seems to last the test of time. One way to check if your bearing grease is worthy rub some of it on your hands and test how hard it is to wash off..
thanks dalton for the tips. 3x3's will come with time. i am running out of money . i would like to get a set of raised spindles, but i have only found one pair they are 300 bucks. have to keep looking. how do i post pics? cant figure it out, i am not real computer savvy. my box of parts should be here today then i can see if i can get this thing to run......fingers crossed! go to ebay and type in "vw spindles raised" I went with kustom1warehouse... I called them up and was able to talk them down to 225.00 I think..
i found them! going to have to order those soon. my engine parts all came except the exhaust. hopefully it comes soon. get the one that is the "disc break" kit... if you have drum breaks you can drill the holes for the backing plates.... give them a call before you order to see if there is any deals.. Cool and welcome to the site!!! We R' Photo Nerds here and we like the V as in Videos!!!! That is my Hint and Tip!! !